Before entering politics, Reagan had been a lifeguard, radio sports announcer, newspaper columnist, motion picture and television actor, president of the Screen Actors Guild (a union), and motivational speaker. His memorable speaking style, widely regarded as well-delivered and persuasive, earned him the nickname "The Great Communicator." Perhaps the most important legacy of Reagan's presidency was he instilled a profound sense of pride and purpose in an American nation that spent the previous decade slipping into self-doubt due to its withdrawal from Vietnam and captivity of its diplomats in Iran. His passion was to instill this pride, improve the quality of American life, and bring about the downfall of communism—what he called "the evil empire." Arguably, he achieved all his goals. Reagan defeated incumbent President Jimmy Carter in an unexpected landslide victory to win the 1980 presidential election, restoring Republican control to the Senate after 26 years. 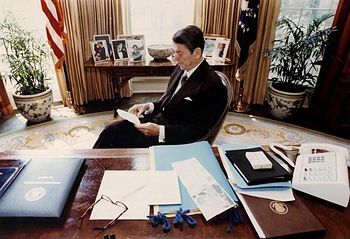 One of the hallmarks of Reagan's administration was his policy of supply-side economics, dubbed by some "Reaganomics," consisting of tax cuts and economic deregulation. He stated in his first inaugural speech that "government is not the solution to our problem; government is the problem." In foreign affairs, Reagan's presidency is noted for a policy shift from communist containment to direct, though diplomatic, confrontation with the Soviet Union, accompanied by dramatically increased military spending. After a 1981 assassination attempt, Reagan came to believe that his life had been spared for a divine purpose: the defeat of communism. 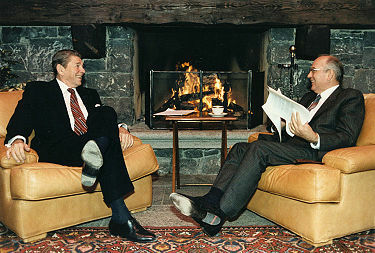 A significant number of former world leaders, scholars, and especially conservatives credit Reagan's policies as instrumental in leading to the collapse of communism in Eastern Europe (1989) and the Soviet Union (1991), particularly beginning with his 1984 Strategic Defense Initiative. In June 2004, Reagan died at age 93 at his home in southern California after a decade of affliction with Alzheimer's disease. Reagan was born on February 6, 1911, in an apartment above a small bakery in Tampico, Illinois. He was the second of two sons born to John "Jack" Reagan, a Catholic of Irish American ancestry, and Nelle Wilson, who was of Scots-Irish and English descent. His paternal great-grandfather, Michael Reagan, came to the United States from Ballyporeen, County Tipperary, Ireland in the 1860s. 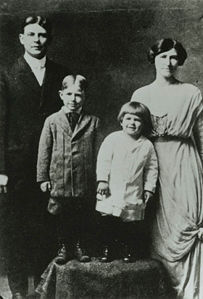 Prior to his immigration, the family name was spelled Regan. His maternal great-grandfather, John Wilson, immigrated to the United States from Paisley, Scotland in the 1840s. In 1920, after years of moving around Illinois, the family finally settled in Dixon. Reagan always considered Dixon to be his hometown. At the age of 10, Reagan was baptized in his mother's Disciples of Christ church in Dixon, although his brother, Neil, became a Catholic, like his father. In 1924, Reagan began attending Dixon's Northside High School. In 1927 at age 16, Reagan took a summer job as a lifeguard in Lowell Park, two miles away from Dixon on the nearby Rock River. He continued to work as a lifeguard for the next seven years, reportedly saving 77 people from drowning. Reagan would later joke that none of them ever thanked him. In future years, he would point to that achievement, proudly showing visitors a picture of Rock River in the Oval Office. In 1928, Reagan entered Eureka College in Eureka, Illinois, majoring in economics and sociology, and graduating in 1932. As a freshman he participated in a student strike against the downsizing of the faculty that was led by Leslie Pierce, the president of Reagan's pledged fraternity. The college president resigned, but his downsizing went forward. In 1929 Reagan joined the Tau Kappa Epsilon fraternity that he later recalled as one of the greatest experiences he had during his college years. He rarely studied and earned mediocre grades as a consequence. Reagan was, however, the "Big Man on Campus" as student body president and leader of numerous clubs and sports groups. Reagan developed an early gift for storytelling and acting. These abilities led to his selection as one of the freshman speakers during the late-night meeting prior to the student strike at Eureka. In 1932, Reagan worked at radio stations WOC in Davenport, Iowa, and then WHO in Des Moines as an announcer for Chicago Cubs baseball games. He received only the bare outlines of the game from a ticker and had to rely on his imagination to flesh out the details of the action. Once, during the ninth inning of a game, the wire went dead, forcing Reagan to smoothly improvise a fictional play-by-play—in which the batter fouled off numerous pitches—until the wire was restored. In 1937, when in California to cover spring training for the Chicago Cubs as a Headline radio announcer, Reagan took a screen test that led to a seven-year contract with the Warner Brothers studio. Reagan's clear voice, easy-going manner, and athletic physique made him popular with audiences; the majority of his screen roles were as the leading man in "B" movies. In 1935, Reagan was commissioned as a reserve officer in the United States Army. Reagan was called up for duty in November 1941 but disqualified for combat due to his astigmatism. After the attack on Pearl Harbor, Lieutenant Reagan was activated and assigned to the First Motion Picture Unit in the United States Army Air Force, to make use of his acting skills for the production of wartime propaganda films. He remained in Hollywood for the duration of the war. 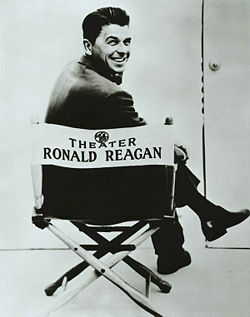 As Reagan's film roles became fewer in the late 1950s, he moved into television as a host and frequent performer for General Electric Theater. He went from host and program supervisor to producing and claiming an equity stake in the TV show itself. The hosting job proved to be quite lucrative for Reagan, as at one point in the late 1950s, he was earning approximately $125,000 per year (around $800,000 in 2006 dollars) from the television show. Aside from its financial benefits, hosting the program raised Reagan's visibility among the general public and served as a springboard for his jump into politics. For many years, Ronald Reagan was a staunch Democrat, supporting Franklin D. Roosevelt and his New Deal. In the late 1940s, he was one of the most visible supporters of FDR's successor, President Harry S Truman. His first major political role was president of the Screen Actors Guild, the labor union that included most Hollywood actors. Reagan claimed that the union was being infiltrated by communists. In this position, he testified before the House Un-American Activities Committee on Communist influence in Hollywood. In public statements, Reagan opposed the practice of blacklisting in Hollywood, but in practice he kept tabs on actors he considered disloyal and informed on them to the FBI under the code name "Agent T-10." Among those he fingered were actors Larry Parks (The Jolson Story), Howard Da Silva (The Lost Weekend) and Alexander Knox (Wilson). Each of them was later called before the House Un-American Activities Committee led by Senator Joseph McCarthy and subsequently blacklisted in Hollywood. This information was not revealed until a 2002 Freedom of Information Act request. In 1966, Reagan, after winning over Richard Nixon for the Republican nomination, was elected the 33rd governor of California. In his first term, he froze government hiring, but he also approved tax hikes to balance the budget. As governor, Reagan took a hard line against protest movements of the era. During the People's Park protests in 1969, for example, he sent 2,200 National Guard troops onto the Berkeley campus of the University of California, infamously remarking, "If it takes a bloodbath, let's get it over with." In 1971, Governor Reagan worked with Democratic Assembly Speaker Bob Moretti to reform California's welfare programs. Reagan had earlier opposed the Civil Rights Act of 1964 and the Voting Rights Act of 1965, but he later reversed his position and felt that they “must be enforced at the point of a bayonet, if necessary.” Reagan also opposed the construction of a large federal dam, the Dos Rios, which would have resulted in the flooding of a valley containing Native American ranches. One of Reagan's greatest frustrations in office concerned capital punishment. He had campaigned as a strong supporter, however his efforts to enforce the state's laws in this area were thwarted by the Supreme Court of California when it issued its People v. Anderson decision. The decision invalidated all death sentences issued in California prior to 1972, but a constitutional amendment quickly overturned it. Despite his support for the death penalty, Reagan granted two clemencies and a temporary reprieve during his governorship. As of 2006, no other clemency has been granted to a condemned person in California. Reagan promoted the dismantling of the public psychiatric hospital system, proposing that community-based housing and treatment replace involuntary hospitalization, which he saw as a violation of civil liberties. The community replacement facilities have never been adequately funded, either by Reagan or his successors. Reagan's first attempt to gain the Republican presidential nomination in 1968 was unsuccessful. He tried again in 1976 against incumbent Gerald Ford but met defeat at the Republican National Convention by a few votes. The 1976 campaign was a critical moment for Ronald Reagan's political development. Ford was largely a symbol of the "old guard" of the Republican Party, and Reagan's success signaled a shift in direction for the party. At the 1976 convention, Reagan gave a stirring speech in which he discussed the dangers of nuclear war and the moral threat of the Soviet Union; it greatly affected the convention's delegates and probably contributed to Reagan's future political success. In 1980, after a very successful primary campaign, Reagan finally won the Republican nomination for president, handily winning most of the primaries after an early defeat in the Iowa caucuses. During the convention, Reagan proposed a complex power-sharing arrangement with Gerald Ford as vice president, but nothing came of it. Instead, Reagan selected his opponent in the primaries, former congressman and Republican National Committee Chairman George H. W. Bush, although Bush had previously declared he would never be Reagan's vice president. Bush was many things Reagan was not: a lifelong Republican, a combat veteran, and an internationalist with experience in the United Nations and the CIA. Bush's economic and political philosophies were supposedly more moderate than Reagan's. Bush had, in fact, referred to Reagan's supply-side influenced proposal for a 30 percent across-the-board tax cut as "voodoo economics." Reagan's performance in the televised debates boosted his campaign. He seemed more at ease than the President, deflecting Carter's criticisms with off-hand remarks like "There you go again." One of his most influential remarks came in the form of a closing question to the audience, during a time of skyrocketing prices and high interest rates: "Are you better off today than you were four years ago?" 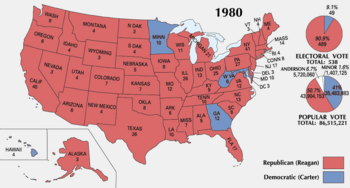 Ronald Reagan defeated Jimmy Carter in an electoral college landslide, carrying every state except Minnesota, Hawaii, Maryland, West Virginia, and Georgia (Jimmy Carter's home state). The final electoral tally: 489 to 49. Jimmy Carter's loss was accompanied by a 12-seat change in the Senate from Democratic to Republican hands, giving the Republicans a majority in the Senate for the first time in 26 years. Reagan accepted the Republican nomination in Dallas, Texas, on a wave of good feeling and renewed optimism bolstered by the recovering economy and the dominating performance by the U.S. athletes at the Los Angeles Olympics that summer, which he himself opened, becoming the first president to open a summer Olympic games held in the U.S. The campaign of 1984 also featured one of Reagan's most famous gaffes. Speaking at a sound check prior to a radio address, Reagan remarked: "My fellow Americans, I'm pleased to tell you today that I've signed legislation that will outlaw Russia forever. We begin bombing in five minutes." Some argued that the comment, spoken during a time of great tension between the United States and the Soviet Union, was a mistake, and many critics questioned Reagan's understanding of the realities of his foreign policy and of international affairs in general. Others, however, saw it merely as a humorous joke, meant only for the reporters in the room that was accidentally broadcast live. Reagan performed weakly in the first televised debate with Mondale, but recovered in the second and was considerably ahead of Mondale in polls taken throughout much of the race. In the final election results, Reagan was re-elected over Mondale in a landslide, receiving nearly 60 percent of the popular vote and winning 49 of 50 states (Mondale carried only his home state of Minnesota and the District of Columbia). 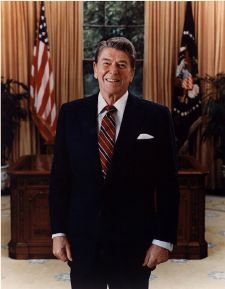 Political commentators often attribute Reagan's victory in the 1984 presidential election to his conversion of the "Reagan Democrats," the traditionally Democratic voters who voted for Reagan in that election. 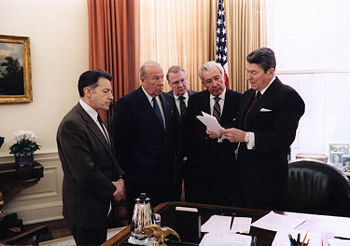 Chaos results after an attempt on President Reagan's life. James Brady and police officer Thomas Delahanty lie wounded on the ground. 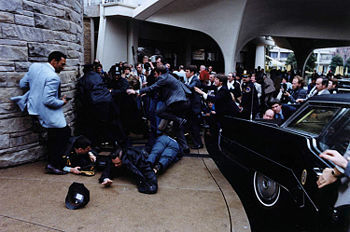 On March 30, 1981, Reagan, his press secretary James Brady, and two others were shot by John Hinckley, Jr. Missing Reagan’s heart by less than one inch, the bullet instead struck his left lung, which likely spared his life. Reagan joked, "I hope you're all Republicans" to his surgeons (though they were not, Dr. Joseph Giordano replied, "We're all Republicans today"). Reagan later famously told his wife "Nancy, honey, I forgot to duck." Hinckley Jr. allegedly shot President Reagan in an attempt to impress young actress Jodie Foster, and remains institutionalized. As Reagan entered office, the nation was in a severe economic crisis. The economy suffered from double-digit inflation—making planning very unpredictable—and 20 percent interest rates—making mortgages prohibitive for many people. Nearly eight million people were unemployed, and workers had suffered a 5 percent decline in real hourly wages over the previous five years, while federal personal taxes for the average family had gone up 67 percent. The national debt was approaching $1 trillion. Reagan was considered to be economically libertarian—in favor of tax cuts, smaller government, and deregulation—but no one knew what concrete steps he planned to take, or whether the Democrat-controlled House would support him. In the summer of 1981 Reagan, backing up a promise, fired a majority of federal air traffic controllers who were members of the Professional Air Traffic Controllers Organization (PATCO) union when they went on an illegal strike and risked the safety of U.S. air travel. Reagan's action was one of political courage, as PATCO had been one of only two unions to support Reagan in the 1980 election. A major focus of Reagan's first term was reviving the economy his administration inherited, which was plagued by a new phenomenon known as stagflation—a stagnant economy plagued with high inflation. His administration fought double-digit inflation by supporting Federal Reserve Board chairman Paul Volcker's decision to tighten the money supply by dramatically hiking interest rates. Economist Milton Friedman said that Reagan "…understood that there was no way of ending inflation without monetary restraint and a temporary recession." Reagan pursued a strategy of combined tight-money policy with across-the-board tax cuts designed to boost business investment, in Reagan's words: "Chicago school economics, supply-side economics, call it what you will—I noticed that it was even known as Reaganomics at one point until it started working..."  Although opponents ridiculed Reagan's economic policy as "voodoo," "trickle-down," and "Reaganomics," he managed to successfully implement his across-the-board tax cuts. As a result of the tight-money policy intended to end inflation, the economy went into a sharp downswing starting in July 1981 and bottomed out a year later in November 1982. Following this recession of 1981-82 and beginning in 1983, the economy staged a dramatic recovery. Reagan's administration claimed that the tax cuts had helped to revive the economy and had led to the creation of jobs, causing increases of federal income tax revenues during the 1980s from $517 billion to over $1 trillion per year. Although income tax revenues increased dramatically during Reagan's presidency, the increases in the military budget stemming from the administration's new Cold War strategy led to the federal deficit reaching levels not seen in years. Critics noted that pumping so much deficit spending into the defense industry was, in reality, classic Keynesian economics, and that the ensuing economy was not the result of tax cuts, but a predictable response to so much government spending. As part of his economic policy of reduced government spending on social programs, Reagan intended to cut many federal programs. The House of Representatives' Democratic majority opposed slowing the growth of these programs and the proposed cuts in other domestic spending. One such cost-cutting move was abolition of the U.S. Metric Board established by President Gerald Ford. Alarmed by the growth in Social Security outlays, Reagan appointed a Social Security reform commission, headed by future Federal Reserve Chairman Alan Greenspan, which reached a consensus on how to slow the growth: the age of receiving benefits would be slowly raised to be in tune with rising life expectancy to ensure system solvency for the next 50-75 years. The plan also increased government revenues by accelerating a previously enacted increase in the rates of social security payroll taxes. During the Reagan presidency, the inflation rate dropped from 13.6 percent in 1980 (President Carter's final year in office) to 4.1 percent by 1988, the economy added 16,753,000 jobs and the unemployment rate fell from 7.5 percent to 5.3 percent (although it increased at one point peaking near 10 percent). In addition, the poverty rate fell from 14 percent to 12.8 percent. Statistics show that Reagan’s economic policies created an increase in the gap between the rich and the poor; however, during the Reagan presidency, all economic groups saw their income rise in real terms, including the bottom quintile, whose income rose 6 percent (Bureau of the Census 1996). The richest 1 percent of the U.S. population saw in increase in 1 trillion dollars during the same time period (Zinn 2003). President Reagan was criticized by the gay rights movement and others for not responding quickly enough to the arrival of HIV-AIDS. The first official mention of the disease in the White House was in October 1982; Reagan himself first publicly discussed the federal government's role in fighting the disease at a press conference in 1985. Despite the criticism, the U.S. Government under Reagan spent $5.7 billion on AIDS and HIV-related programs, with large amounts going to the National Institutes of Health. The resources for research increased by 450 percent in 1983, 134 percent in 1984, 99 percent the next year, and 148 percent the year after. By 1986, Reagan had endorsed a large prevention and research effort and declared in his budget message that AIDS "remains the highest public health priority of the Department of Health and Human Services." Although Reagan's second term was mostly noteworthy for matters related to foreign affairs, his administration supported significant pieces of legislation on domestic matters. In 1982, Reagan signed legislation reauthorizing the Voting Rights Act of 1965 for another 25 years even though he had opposed such an extension during the 1980 campaign. This extension added protections for blind, disabled, and illiterate voters. The fight against communism and the implementation of supply-side economics dominated his presidency, but Reagan also took a strong stand against abortion. He published the book Abortion and the Conscience of a Nation, which decried what Reagan saw as disrespect for life, promoted by the practice of abortion. Many conservative activists refer to Reagan as the most pro-life president in history. However, two of the three Supreme Court justices he selected, Sandra Day O'Connor and Anthony Kennedy, voted to uphold Roe v. Wade and as governor, Reagan signed into law California's liberal abortion rights legislation. Other significant legislation included the overhaul of the Internal Revenue Code in 1986, as well as the Civil Liberties Act of 1988, which compensated victims of the Japanese-American internment during World War II. Reagan also signed legislation authorizing the death penalty for offenses involving murder in the context of large-scale drug trafficking; wholesale reinstatement of the federal death penalty would not occur until the presidency of Bill Clinton. Deregulation was another central tenet of Reagan's domestic policy, and economist Milton Friedman has pointed to the decline in the number of pages added to the Federal Register each year as evidence of the anti-regulatory nature of Reagan's presidency. The first term of Reagan's presidency was marked by harsh, anti-communist rhetoric. On March 3, 1983, he was blunt: "I believe that communism is another sad, bizarre chapter in human history whose last pages even now are being written." His most detailed analysis came on June 8, 1982, in an address to the British Parliament, stunning the Soviets and U.S. allies alike. The prevailing doctrine in the West had been one of accommodation and acceptance of the Soviet Union. Reagan, however, argued that the Soviet Union was in deep economic crisis, and that it could be made worse by cutting off Western technology. According to Reagan, the Soviet Union "[ran] against the tide of history by denying human freedom and human dignity to its citizens." President Reagan and Soviet General Secretary Mikhail Gorbachev at the first Summit in Geneva, Switzerland, November 1985. Reagan forcefully confronted the Soviet Union, signaling a sharp departure from the détente observed by his predecessors Richard Nixon, Gerald Ford, and Jimmy Carter. Under the assumption that the Soviet Union could outspend the U.S. government in a renewed arms race, he strove to make the Cold War economically and rhetorically hot. To end the Cold War, the administration oversaw a military build-up that represented a policy named "peace through strength," a name which harkens back to the Theodore Roosevelt-era foreign policy of "Speak softly and carry a big stick." The Reagan administration set a new policy toward the Soviet Union with the goal of winning the Cold War by using a strategy outlined in NSDD-32 (National Security Decision Directive). Clandestine: support anti-Soviet factions around the world from Mujahideen insurgents in Afghanistan to Poland's Solidarity movement. 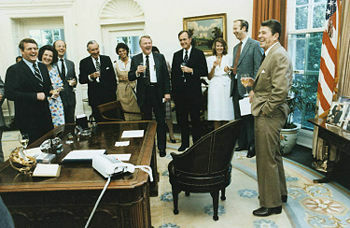 Reagan argued that the American economy was on the move again; with the rapid computerization of the economy, high technology was the driving force. But the Soviets lagged far behind when it came to high technology, and slipped further every year. Reagan made the Soviet predicament far worse by forbidding high tech exports to the Soviets from the U.S. or its allies. For a while the decline was masked by high prices for Soviet oil exports, but that advantage collapsed in the early 1980s. The economic race with the West required radical reforms, which Gorbachev imposed. He hoped his new policies of glasnost and perestroika would revitalize the Soviet economy, but instead of new solutions he heard new complaints. Reagan's military build-up, coupled with his fierce anti-Soviet rhetoric, contributed to a Soviet near-panic reaction to a routine NATO exercise in November 1983, Able Archer 83. Though the threat of nuclear war ended abruptly with the end of the exercise, this historically obscure incident illustrates the possible negative repercussions of Reagan's "standing tall" to a nuclear power. Some historians, among them Beth B. Fischer in her book The Reagan Reversal, argue that the ABLE ARCHER 83 near-crisis had a profound effect on President Reagan and his turn from a policy of confrontation towards the Soviet Union to a policy of rapprochement. On March 11, 1990, led by newly-elected Vytautas Landsbergis, Lithuania declared independence from the Soviet Union. The announcement was followed by those of other Soviet Socialist Republics, and by Christmas Day 1991 the Soviet Union was officially dissolved. British Prime Minister Margaret Thatcher said, "Ronald Reagan won the Cold War without firing a shot." 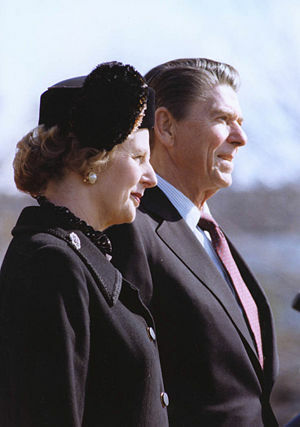 Among European leaders, his main ally and undoubtedly his closest friend was Margaret Thatcher, Prime Minister of the United Kingdom, who supported Reagan's policies of deterrence against the Soviets. Although the administration negotiated arms-reduction treaties such as the Intermediate-Range Nuclear Forces Treaty and the START Treaty with the U.S.S.R., it also aimed to increase strategic defense. A controversial plan, named the Strategic Defense Initiative (SDI), was proposed to deploy a space-based defense system to make the U.S. invulnerable to nuclear weapon missile attack, by means of a network of armed satellites orbiting the Earth. Critics dubbed the proposal "Star Wars" and argued that SDI was unrealistic, a violation of ABM treaties, and as a weapon that defends the U.S. if it strikes first, would inflame the arms race. Supporters responded that even the threat of SDI forced the Soviets into unsustainable spending to keep up. In fact, the Soviets both attempted to follow suit with their own program and attempted to reign in, or at least slow down the growing U.S. military advantage with a program of arms reduction treaties. Ultimately they proved somewhat more successful with the latter approach, as trying to keep up with the U.S. in the area of military spending and research and development (not just on strategic defense systems) severely damaged an already shaky Soviet economy. This is considered one of the major contributing factors to the fall of the Soviet Union. Support for anti-communist groups including armed insurgencies against communist governments was also a part of administration policy, referred to by his supporters as the Reagan Doctrine. Following this policy, the administration funded groups they called "freedom fighters"—described as terrorists by their detractors—such as the Mujahideen in Afghanistan, the Contras in Nicaragua, and Jonas Savimbi's rebel forces in Angola, all of which were fighting Soviet- or Cuban-backed Marxist governments. The Reagan administration increased military funding for anti-communist dictatorships throughout Latin America and may have been involved in the assassinations of several Latin American presidents and prime ministers. The administration also helped to fund Eastern European anti-communist groups such as the Polish Solidarity movement and those fighting against the communist regime in Cambodia. Reagan offered controversial support to the rightist El Salvador government throughout his term, as he feared a takeover by the Socialist FMLN during the El Salvador Civil War that had begun in the late 1970s. The war left 75,000 people dead, 8,000 missing and one million homeless. He backed attempts at introducing democratic elections with mixed success. A communist coup on Grenada in 1983 led the administration to invade the small island island, which successfully removed the communist government and Cuban advisers. The administration took a strong stance against the Lebanese Hezbollah terrorist organization, which was taking American citizens hostage and attacking civilian targets after Israel invaded Lebanon in the 1982 Lebanon War. It similarly took a strong stance against Palestinian terrorists in the West Bank and Gaza Strip. U.S. involvement in Lebanon followed a limited-term United Nations mandate for a multinational force. A force of 800 U.S. Marines was sent to Beirut to evacuate PLO forces. The September 16, 1982 massacre of hundreds of Palestinian civilians in Beirut prompted Reagan to form a new multinational force. Intense administration diplomatic efforts resulted in a peace agreement between Lebanon and Israel. U.S. forces were withdrawn shortly after the October 23, 1983 bombing of a barracks in which 241 Marines were killed. Reagan called this day the saddest day of his presidency and of his life. Initially neutral, the administration increasingly became involved in the Iran-Iraq War (1980–1988). At various times, the administration supported both nations but mainly sided with Iraq, believing that Iraqi President Saddam Hussein was less of a threat to the stability of the region than was Iranian Supreme Leader Ayatollah Khomeini. Henry Kissinger articulated the difficult nature of the situation when he stated, "Too bad they both can't lose." U.S. policymakers feared that an Iranian victory would embolden Islamic fundamentalists in the Middle East, perhaps leading to the overthrow of secular governments, and takeovers of Western corporate holdings in Saudi Arabia, Jordan, and Kuwait. After initial Iraqi military victories were reversed and an Iranian victory appeared possible in 1982, the American government initiated Operation Staunch to attempt to cut off the Iranian regime's access to weapons (notwithstanding their later shipment of weapons to Iran in the Iran-Contra Affair). The U.S. also provided military intelligence information and financial assistance to the Iraqi military regime. Further, the Reagan administration allowed the shipment of "dual use" materials to Iraq that could be used for chemical and biological weapons, which Iraq claimed were required for agriculture, medical research, and other civilian purposes, but which were diverted to use in Saddam's weapons of mass destruction programs. Concurrently with the support of Iraq, the administration also engaged in covert arms sales to Iran as a means to provide funds to the Contra rebels in Nicaragua. Previously, Congress ended U.S. support for the anti-communist Contras, but the Reagan administration continued to provide aid. The resulting Iran-Contra Affair became a large scandal. Reagan professed ignorance of the plot's existence and quickly called for an independent counsel to investigate. Ten officials in the Reagan administration were later convicted and others forced to resign as a result of the investigation. Reagan’s secretary of defense, Casper Weinberger, was indicted for perjury and later received a presidential pardon from George H. W. Bush, days before the trial was to begin. Reagan's critics frequently charged that his personal charm permitted him to say nearly anything and yet prevail, a quality that earned him the nickname "The Teflon President." His denial of awareness of the Iran-Contra scandal was belied by quotations in now-archived notes by his defense secretary, Caspar Weinberger, that he (Reagan) could survive violating the law or Constitution, but not the negative public image that "big, strong Ronald Reagan passed up a chance to get the hostages free." In December 1985, Reagan signed a secret presidential "finding" describing the deal as "arms-for-hostages." Reagan-era papers that might provide further details were originally scheduled to be released starting in 2001, but President George W. Bush enacted a rule change to allow many of these to be withheld indefinitely. Critics also have alleged that Reagan's fiscal and tax policies dramatically increased social inequality and that his efforts to cut welfare and income taxes primarily benefited the well-off in America. The unprecedented growth of the national debt during his presidency also sparked charges of endangering the economic health of the nation. Following the deregulation of the banking industry in the 1980s, savings and loan associations (also known as thrifts) were given the flexibility to invest their depositors' funds in commercial real estate when, previously, they had been restricted to investing in residential real estate. Many savings and loan associations began making risky investments. As a result, the Federal Home Loan Bank Board (FHLBB), the federal agency that regulates the industry, tried to clamp down on the trend. In so doing, however, the FHLBB clashed with the Reagan administration's policy of permitting the deregulation of many industries, including the thrift industry. The administration declined to submit budgets to Congress that would request more funding for the FHLBB's regulatory efforts. The resulting savings and loan scandal bailout ultimately cost the United States $150 billion and nearly caused the total collapse of the industry. Reagan's foreign policy also drew intense criticism from liberals who charged that his policies were bringing the U.S. perilously close to nuclear war. Critics also charged that he was ignoring human rights abuses in Central and South America and South Africa. Although Reagan sought an end to apartheid and liberalization of South Africa, he opposed economic sanctions "on grounds that it would diminish influence on the South African government and create economic hardship for the very people in South Africa that the sanctions were ostensibly designed to help" (Donald T. Regan, "For the Record"). African-American leaders sharply criticized Reagan's wavering stance against apartheid in South Africa. Reagan was routinely lampooned by much of the American media as being dim-witted, if not senile. To some Americans, Reagan seemed aloof and uninvolved with the daily decision-making process of his administration, which may have led to scandals like the Iran-Contra affair. On January 11, 1989, Reagan addressed the nation one final time on television from the Oval Office, nine days before handing over the presidency to George H. W. Bush. After Bush's inauguration, Reagan returned to his estate, Rancho del Cielo, near Santa Barbara, California, to write his autobiography, ride his horses, and maintain the ranch. He eventually moved to a new home in Bel-Air, Los Angeles. In the autumn of 1989, Fujisankei Communications Group of Japan hired him to make two speeches and attend a small number of corporate functions. Reagan's fee during his nine-day visit was about $2 million, more than he had earned during eight years as president. Reagan made occasional appearances on behalf of the Republican Party, including a well-received speech at the 1992 Republican National Convention. He publicly spoke out in favor of a line-item veto, a constitutional amendment requiring a balanced budget, and repealing the 22nd Amendment, which prohibits a president from serving more than two terms. On November 5, 1994, Reagan announced that he had been diagnosed with Alzheimer's disease. He informed the nation of his condition via a handwritten letter. With his trademark optimism, he stated in conclusion: "I now begin the journey that will lead me into the sunset of my life. I know that for America there will always be a bright dawn ahead. Thank you, my friends. May God always bless you." As the years went on, the disease slowly destroyed his mental capacity, forcing him to live in quiet isolation. By late 2003, Reagan had begun to enter the final, fatal stage of his disease. Reagan died of pneumonia on June 5, 2004 at his home in Bel-Air, California. He is buried at the Ronald Reagan Presidential Library in Simi Valley. Because of his love for Jelly Belly jellybeans, a small packet containing them was buried with him in his suit pocket. Reagan married actress Jane Wyman on January 24, 1940; they had a daughter, Maureen in 1941; an adopted son, Michael in 1945, and a second daughter, Christine, who died shortly after her birth in 1947. They divorced in 1948. 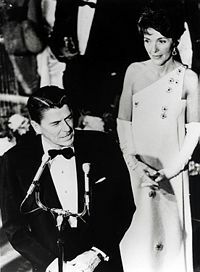 Reagan remarried on March 4, 1952, to actress Nancy Davis. Their daughter Patti was born on October 21 of the same year. In 1958 they had a second child, Ron. To his children, Ronald Reagan seemed distant and disinterested, but to his wife Nancy, he was anything but. 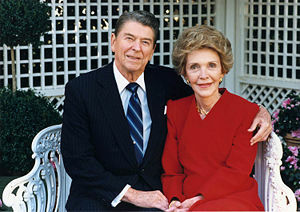 The Reagans had an unmistakably close relationship, one in which Nancy often served as her husband's chief adviser and confidante. A security officer at the Reagans' California ranch said this of their relationship: "She lived for him and he for her. She's the most protective woman I've ever seen. But she knew that that ranch was Ronald Reagan's longevity, so she put up with it. She ended up enjoying it, but she did it for him." Though he rarely attended church as an adult, Reagan was a Christian from his childhood, and frequently addressed Christian groups. In a 1978 letter to a liberal Methodist minister who was skeptical about Christ's divinity—and who accused Reagan of a "limited Sunday school level theology"—Reagan argued strongly for Christ's divinity, using C. S. Lewis's Trilemma. Despite his personal wishes and beliefs, his state funeral was an interfaith service. The Gallup Organization recently took a poll on the most popular presidents in U.S. history. Ronald Reagan was chosen by 87 percent of Americans polled, followed by John F. Kennedy, Dwight D. Eisenhower, and Franklin D. Roosevelt. Ronald Reagan continues to be named year after year by Gallup and other polling organizations as one of the United States' greatest presidents. On February 6, 1998, Washington National Airport was renamed Ronald Reagan Washington National Airport by a bill signed into law by President Bill Clinton. Three years later, the USS Ronald Reagan was christened by the U.S. Navy. It is one of only a few ships christened in honor of a living person and the first to be named in honor of a living former president. Many other highways, schools and institutions were also named after Reagan in the years after his retirement and death. In 2002, Congress authorized the creation of Ronald Reagan Boyhood Home National Historic Site in Dixon, Illinois pending federal purchase of the property. In 2004, the Illinois State Toll Highway Authority voted to rename Interstate 88, which was formerly called the East-West Tollway, in Reagan's memory. In 1989, Reagan received an honorary British knighthood, Knight Grand Cross of the Order of the Bath. This entitled him to the use of the post-nominal letters GCB, but did not entitle him to be known as "Sir Ronald Reagan." He, along with presidents Dwight D. Eisenhower and George H. W. Bush, have all received the honor. ↑ Peter Schweizer, Reagan's War: The Epic Story of His Forty-Year Struggle and Final Triumph Over Communism (Doubleday, 2002), 3. ↑ Associated Press, Reagan, FBI, CIA tried to quash campus unrest, USA Today, June 8, 2004. Retrieved July 16, 2007. ↑ Ron Elving, Looking Back at Reagan Through a Nostalgic Mist, NPR. Retrieved July 16, 2007. ↑ Third World Traveler, The Ronald Reagan Myth, The Progressive Review. Retrieved July 16, 2007. ↑ Associated Press, Carter expresses grief over loss of former president, AccessNorthGa.com. Retrieved July 16, 2007. ↑ Commission on Presidential Debates, The Carter-Reagan Presidential Debate, October 28, 1980. Retrieved July 16, 2007. ↑ Associated Press, Mondale's Acceptance Speech, 1984, AllPolitics. Retrieved July 16, 2007. ↑ Hedrick Smith, "Reagan's Gaffe," New York Times, August 16, 1984. ↑ CNN, Ronald Reagan: The "Great Communicator," June 8, 2004. Retrieved July 16, 2007. ↑ William A. Niskanen and Stephen Moore, Supply Tax Cuts and the Truth About the Reagan Economic Record, Cato Policy Analysis 261 (October 22, 1996). Retrieved July 16, 2007. ↑ Peter M. Robinson, Ronald Reagan, 1911–2004: "Morning Again in America," Hoover Digest 2004(3). Retrieved July 16, 2007. ↑ Ronald Reagan, Remarks at a White House Briefing for Members of the Deficit Reduction Coalition, Public Papers of Ronald Reagan, 1981–1989, July 10, 1987. Retrieved July 16, 2007. ↑ National Bureau of Economic Research, Business Cycle Expansions and Contractions. Retrieved July 16, 2007. ↑ Jonathan Weisman, Reagan Policies Gave Green Light to Red Ink, Washington Post, June 9, 2004. Retrieved July 16, 2007. ↑ U.S. News & World Report, "Reagan Weighs In On Social Issues," May 12, 1982. ↑ P. Noonan, When Character Was King (Penguin, 2001 ISBN 0142001686), 115. ↑ CNN, Top 25 Most Fascinating People, transcript, hosted by Bill Hemmer, May 14, 2005; CNN, Top 25: Fascinating people, June 19, 2005. Retrieved July 16, 2007. Busch, Andrew E. "Ronald Reagan and the Defeat of the Soviet Empire." Presidential Studies Quarterly 27, no. 3 (1997): 451+. Knopf, Jeffrey W. Did Reagan Win the Cold War? Strategic Insights 3, no. 8 (August 2004). Retrieved July 16, 2007. All links retrieved July 17, 2015. This page was last modified on 17 July 2015, at 16:07.